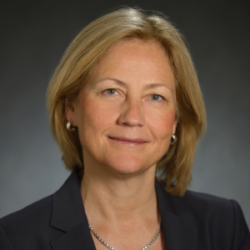 Dr. Jensen is Professor of Neurology and Chair of Neurology at the Perelman School of Medicine, University of Pennsylvania, and also serves as the Co-Director of Penn Translational Neuroscience Center. She was formerly Professor of Neurology, Harvard Medical School, Director of Translational Neuroscience and senior neurologist at Boston Children’s Hospital, as well as senior neurologist at the Brigham and Women’s Hospital. She is a graduate of Cornell Medical College and did her neurology residency training at the Harvard Longwood Neurology Residency Program. Her research focuses on mechanisms of epilepsy and stroke, with specific emphasis on injury in the developing brain as well as age-specific therapies for clinical trials development. She serves on the scientific advisory panel at NIH for the BRAIN Initiative and was elected to the National Academy of Medicine in 2015. She has authored over 130 manuscripts on subjects related to her research, and has been continuously funded by NIH since 1987. She is also an advocate for awareness of the adolescent brain development, its unique strengths and vulnerabilities, as well as their impact on medical, social, and educational issues unique to teenagers and young adults. She is author of the 2015 book “The Teenage Brain,” which has been translated and published in over 20 languages worldwide.